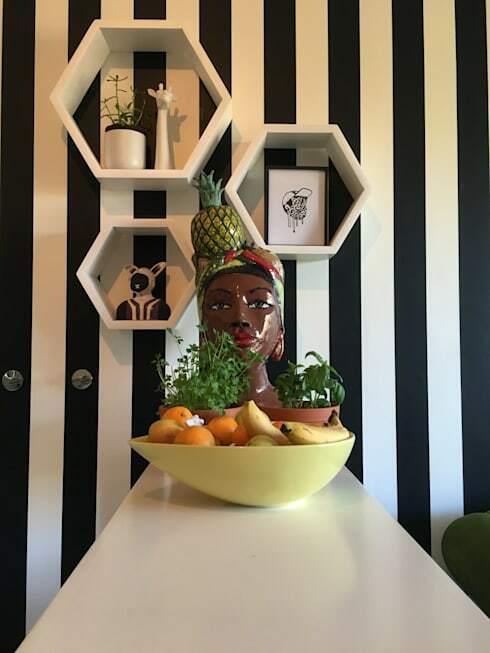 Today on homify 360° we delve into a local home situated in good ol’ Cape Town. But, unlike previous discoveries, this one doesn’t have an ocean view or a prime outlook on a beach to lure you in. What made us pick this one, then? Its delightful commitment to quirkiness, as evidenced by its exceptional interior design. Even thought it showcases beautiful furniture and modern design, it has a unique ambience and look which leads us away from a cutting-edge style and rather treats us to a more laid-back, upbeat one via colours, patterns and décor pieces. We start off with a glimpse of the living room, and this space completely changes the rules in terms of colour contrast. The general rule is that colours directly opposite each other are most effective in contrasting with one another. And even though green and purple are not generally considered as two hues that will complement one another, it just seems to work in this particular space. 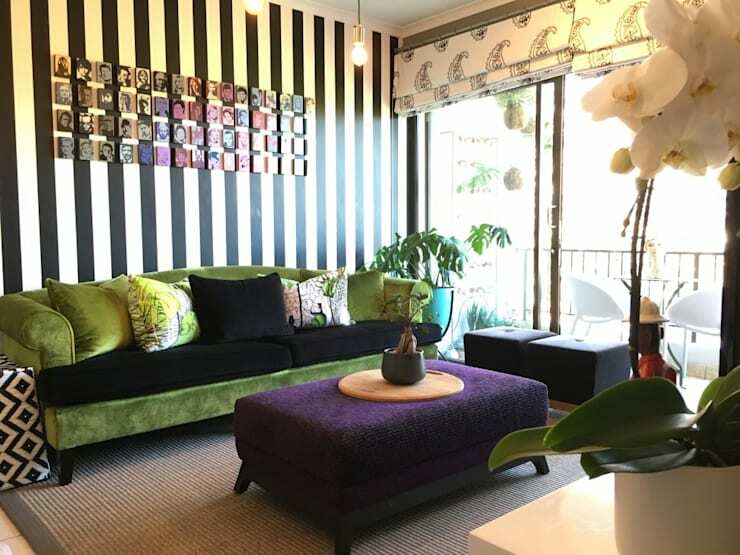 Throw in some delightful stripes for the one wall, paisley for the roller blinds, and some potted plants for a touch of lushness, and we have a rather comfortable and stylish living room to retire to. The choice in furnishings and decorative pieces was to showcase these young homeowners’ unique tastes and personalities. And how often do you encounter vertical stripes paired with hexagon shapes? This turns out to be a rather charming combination, ensuring visual detail that doesn’t get out of hand thanks to the neutral colours. Everywhere we look, contrast seems to be the main theme. 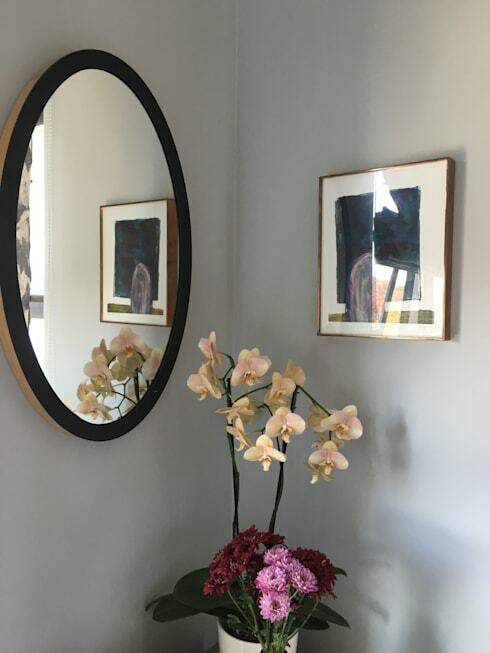 Notice how the oval-shaped mirror offsets with the square wall art; and how both pieces’ neutral hues contrast with the fiery tones of the potted flower. Does your interior style back home provide the same contrast in terms of shapes, colours and materials? It seems to work in here! We close off our quick tour with a look at the bedroom, which seems to be the most serene space in the whole house. 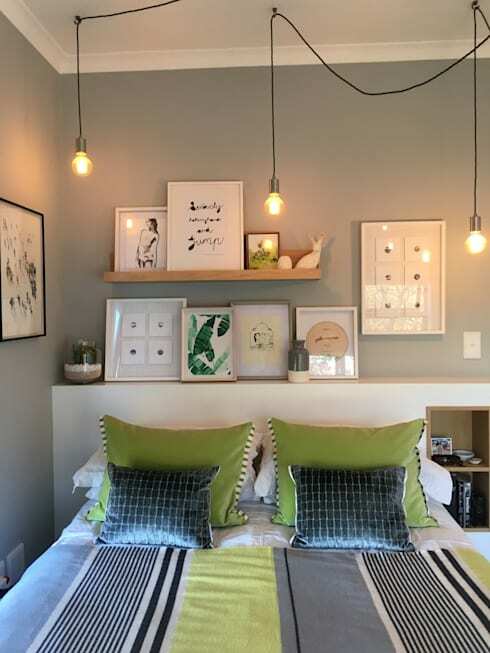 Refreshing hues of natural greens and neutral hues spruce up the linen, while a decent selection of wall art ensures visual detail. Notice the half-wall behind the bed on which various décor pieces are kept, but which also fulfils the part of a headboard! And we just love those unique ceiling lights, adding some industrial-style charm into the space while dangling like oversized fireflies above the bed. We always enjoy reading your comments, so tell us what you think about this home’s unique style.